I wrote out a list last night of everything that I wanted to get done today. And I am already done with my list! I even managed to clean the office too! Which was quite a task considering it was full of random baby items as well as tons of paperwork that needed to be sorted. I think I will have to make this list thing a habit! I feel so much more accomplished today than I do most days! And dinner is in the process baking! I am making the Meatloaf recipe from the Deceptively Delicious Cookbook! Speaking of the Deceptively Delicious cookbook, I have a great tip for you! 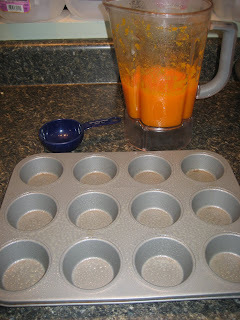 After you make your purees, Spray a muffin tin with cooking spray. Then pour your puree into the muffin tin. Then just place your muffin tin in the freezer overnight. In the morning, or whenever you get a chance remove your purees from the muffin tin and place them into a labeled freezer bag and voila you have perfectly 1/2 cup portions of puree! What a great idea! I just recently got that cookbook. I'm hoping that I can use it for my husband-he only eats pizza, chicken, and ham sandwiches. I'm trying to incorporate more healthy food into his life, and there are great ideas in that cookbook. Thanks for the tip!! My husband is not a fan of veggies or anything healthy and he loves the recipes in that cookbook! The Aloha Chicken is like his favorite meal ever! The Meatloaf and the Spaghetti Pie are also really good! I just got all of the ingredients to attempt her beef stew too! Great Idea!!! I am going to try it. I made the lasagna the other night and it turned out pretty good. I am just questioning how much nutrients it really adds, it is only a half cup of cauliflower and a half cup of sweet potatoe in the whole recipe. Is it really worth the trouble?? Oh and the kids DID NOT like the sweet potatoe pancakes- they had a wierd texture. I thought that too about how much 1/4 cup amounts really add. I usually double if not triple the amount of puree that the recipe calls for.